These natural cotton pads and rolls are designed for hydrocarbon spills. 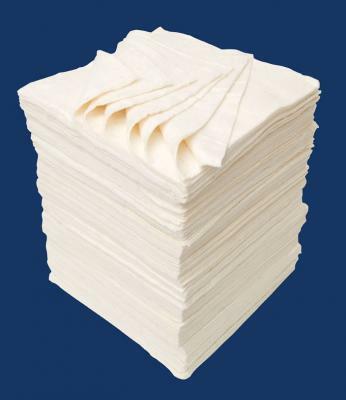 The natural, biodegradable cotton offers superior absorbency and improved strength and durability. They are most effective when used in conjunction with a loose particulate sorbent, such as KleenSweep. For use on all hard surfaces and on water to absorb oil and fuel spills. They can also be used for cleaning up spills of animal, vegetable, mineral and synthetic oils, and oil-based paints. Commonly used in the automotive, industrial, commercial markets, marine, warehousing, waste management and manufacturing industries. Highly absorbent — each 200gsm pad absorbs up to 750mL of oil, 400gsm pads can absorb up to 1.4L of oil, and each roll absorbs up to 152 L of oil. Natural oils prevent water absorption. Good tear strength — durable and designed to handle aggressive fluids. Environmentally friendly & safe — non-toxic and biodegradable, manufactured from sustainable materials. Easy to use — fast, lightweight & offers multiple disposal options.